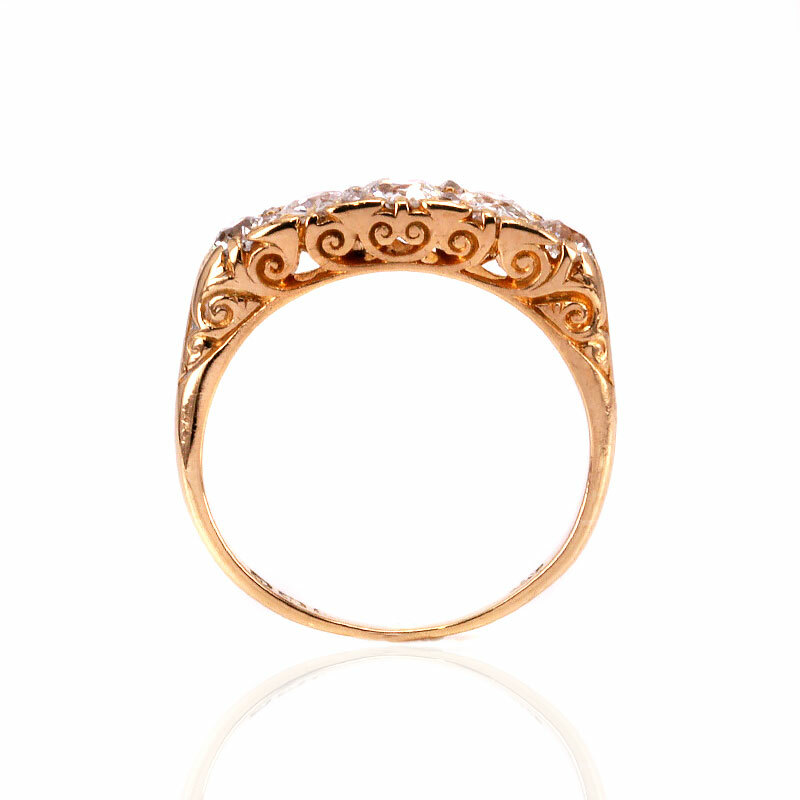 Product code: ES7812 Categories: Antique, Antique Engagement Rings, Antique Rings. Here is a stunning Edwardian era antique diamond engagement ring made in 1902 that not only looks incredible from the top when you admire all the diamonds, but also the elegant and intricate scroll work on the side. Antique diamond engagement rings are always so unique and special as they were hand made and this engagement ring is certainly no exception. Set with five large antique European cut diamonds, set between each diamond are two smaller antique rose cut diamonds. The five main European cut diamonds graduate so elegantly in size to the largest one in the centre, and these diamonds total an impressive 1.34 carats. The sparkle from these diamonds is wonderful and with the addition of the smaller rose cut diamonds, this ring will have you admiring it every time that it is on your finger. The smaller rose cut diamonds add that extra sparkle and total 0.04 carats and show how much thought and time went into making this ring. Modern antique reproduction engagement rings simply don’t have this extra level of character which is just one of the many reasons why there is nothing quite like a genuine antique diamond engagement ring. And then looking at the ring from the side, there is the most wonderful scroll work which is a testament to the level of quality and craftsmanship that went into hand making this ring well over 100 years ago, yet is still not only in superb condition but looks as beautiful today as it did all those years ago. Measuring 19.1mm across by 6.2mm wide at the centre, this is a stunning antique diamond engagement ring from the magical and romantic Edwardian era. This antique diamond engagement ring is set with antique European cut diamonds and between each is set two rose cut diamonds. Both the rose cut diamond and the European cut diamond are so sought after today and nothing beats the genuine antique cut diamonds. 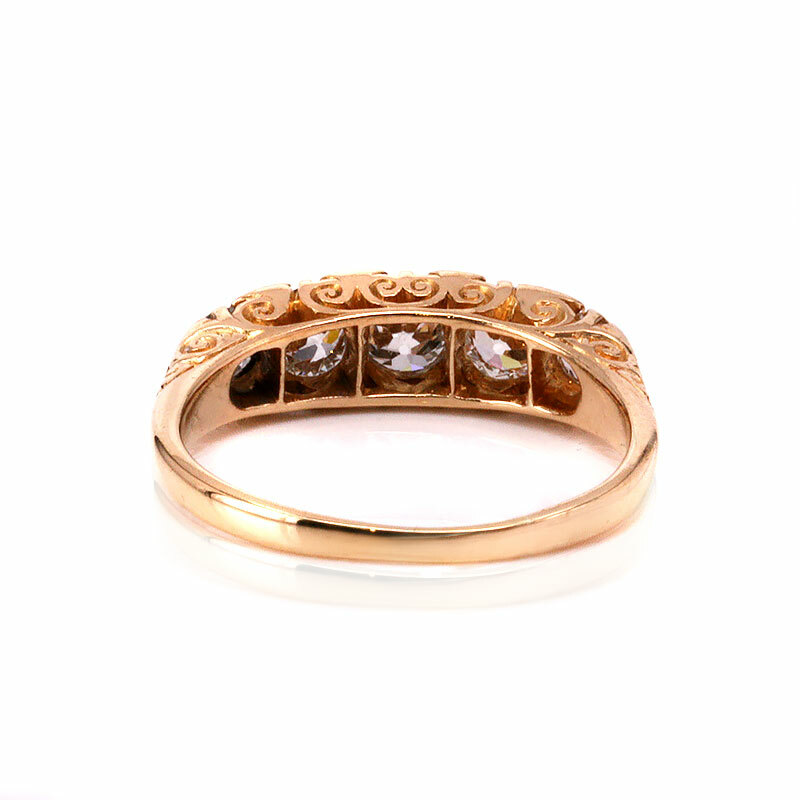 Antique diamond engagement rings such as this, were all hand made and this one has incredible scroll work on the sides. This is a lovely example of a genuine antique diamond engagement ring to always be loved and admired.